PayPal Chip Card Reader Guide. Ready to take more kinds of payments? Just download the PayPal Here app on your compatible smartphone or tablet, pair it with your Chip Card Reader, and you’ll be all set to start getting paid. Get to know your Chip Card Reader. 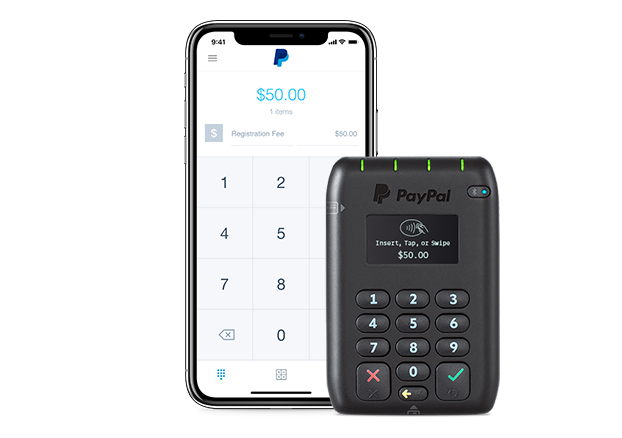 The PayPal Chip Card Reader is an easy to use, quick, and secure way to process chip card, contactless, and swipe payments on-the-go or in your store. Go to your mobile device Settings and turn on Bluetooth®. You’ll see a list of available Bluetooth devices. Turn on the card reader. The on-screen Bluetooth icon will start to blink rapidly, indicating that it’s ready to connect. Select the card reader from the list of available Bluetooth devices. A steady Bluetooth light on the card reader will indicate that it’s successfully paired. From now on, your card reader will auto-connect to the app whenever you turn it on. Watch our video to learn more about pairing devices. Learn how to accept all kinds of mobile payments. Many cards now contain EMV chip technology, which creates a unique code for every transaction to help reduce fraud. Accept Apple Pay®, Samsung Pay, and other contactless payments for your business. All credit cards continue to have magnetic stripes in case a customer doesn’t have an EMV chip card. Apple Pay is a trademark of Apple Inc., registered in the U.S. and other countries. Samsung Pay is a registered trademark of Samsung Electronics Co., Ltd. Android is a trademark of Google LLC. Choose your Chip Card Reader accessories. Get a Chip Card Reader today.